The PAX is the group of men who have made F3 part of their lives. 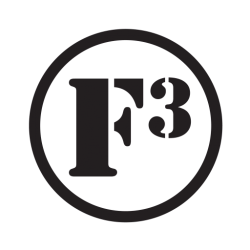 Once a FNG has posted to a F3 workout, he receives his F3 name. One rule when receiving your F3 name: DO NOT try to name yourself. The PAX names all FNGs. Girardi (Launch Q), Doc (Launch Q), Lee (Launch Q), CDC, Clueless, CoCo Crisp, Dreamliner, Guitar Hero, Huggy Bear, Mama’s Boy, Knee Jerk, Pitino, Ocho, Pate, Gekko, Antonio Table, Haskell, Old Bay, Pierogi, Pet Sounds, Stroller, Trinity, Screen Door and of course OBT.